Can’t argue with Bryan Maunu, GM and Chef at Saddles BBQ Bistro. He has a passion for cooking, especially BBQ, and it’s on display at the 2 year old BBQ establishment that can be found in the heart of Madrid. What does Bryan really loves about the business? I get to cook with live fire. Most people don’t understand that it is easy to cook BBQ, but it just takes time. Some of the challenges to the business? Right now the biggest challenge to overcome is staying ahead of the beef, pork and dairy prices. With those three at all-time highs it is tough to make a profit. Another challenge I have is making the processes in the kitchen more efficient. I usually only change something if is going to make life easier. What’s been the most interesting thing to happen to Saddles BBQ? A local production company used out basement and roof to film a zombie movie. We then held a screening in the street in front of the store for the community to come out and watch. 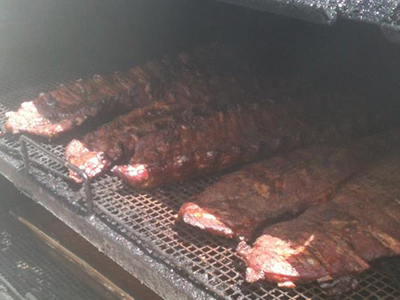 What Cambro products does Bryan and Saddles BBQ rely upon? I use Cambro storage containers for sauces and sides. I use the insulated carriers for off-site events. 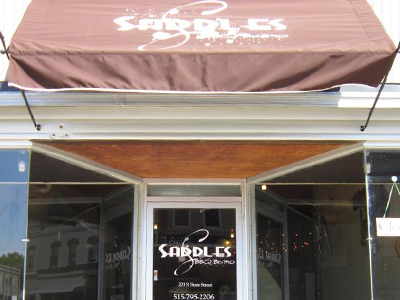 Saddles BBQ sounds like it’s positioned for continued success in Madrid, Iowa and we wish them continued success. As the business of the week selection, Bryan will receive a prize package of Cambro storage products. Nominate your business to be the Cambro Foodservice Business of the Week – click here!